dailydelicious: Strawberry milk Macarons: I'm dreaming of a red macaron! 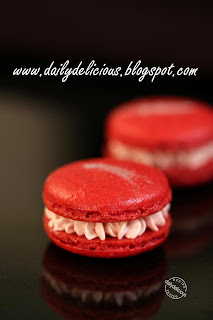 Strawberry milk Macarons: I'm dreaming of a red macaron! I have a lot of imagination when thinking about baking, sometimes I close my eyes and dream about something that I want to make, haha, I'm just a baking freak! I dream about making the Strawberry Macarons, that you will really believe that you eating the strawberry for a long time, haha. When I saw the real fruit powder, I think it's a good idea to try ^^. But only the powder will never deliver all the flavor that I want, I think about something more. I remember that there is a buttercream that use milk +flour as a base, so how good it will be if I put the strawberry preserve into it. Because this kind of buttercream has a milk and flour base, not an egg so it doesn't contain the sugar. When making Italian meringue, Swiss meringue or French buttercream, you need some sugar to cook with egg, so it's not easy to add jam or preserve into the buttercream without adding more sweetness. 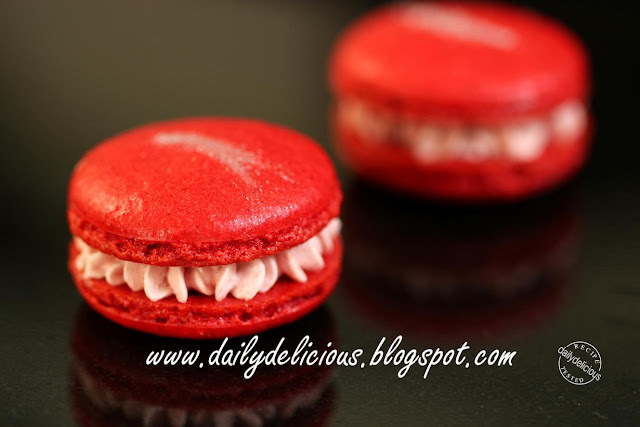 So I choose this kind of buttercream as the filling and it makes my macarons taste like eating strawberry with milk. 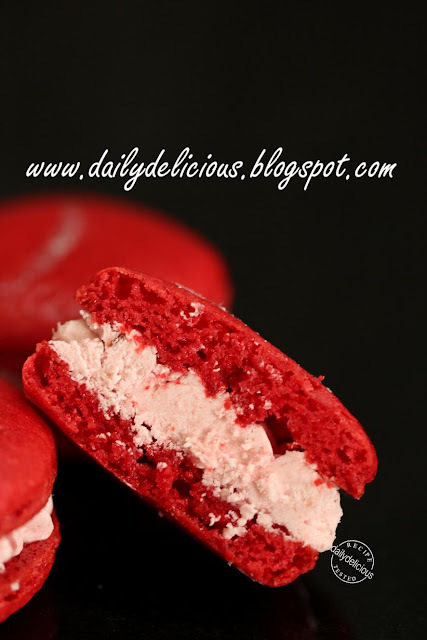 Don't worry if you can't find real fruit powder, you can add strawberry extract in the macaron instead. For the strawberry milk buttercream I use strawberry preserve from Tiptree, if you different brands, the amount will be more or less, and up to your taste too. The other reason for me to make this macaron is the book that I got a long time ago" .............. I want to try the macaron recipe in this book. For me chef .............. is quite remarkable, the Japanese pastry chef in Paris that stands strong ^^, he has four boutiques in Paris! “I like to create simple things, but it is the most difficult thing to do, since simple things cannot be manipulated,” Chef .......... writes on his website, and that's what he do, simple French pastry with Japanese twist. Well I hope that I will have a chance to taste his creation one day, may be next year hehe,^^. Right now I just follow some of his recipe and be happy with the result. Combine the icing sugar, Strawberry powder and almond flour in a medium bowl. If grinding your own nuts, combine nuts and a cup of icing sugar in the bowl of a food processor and grind until nuts are very fine and powdery. 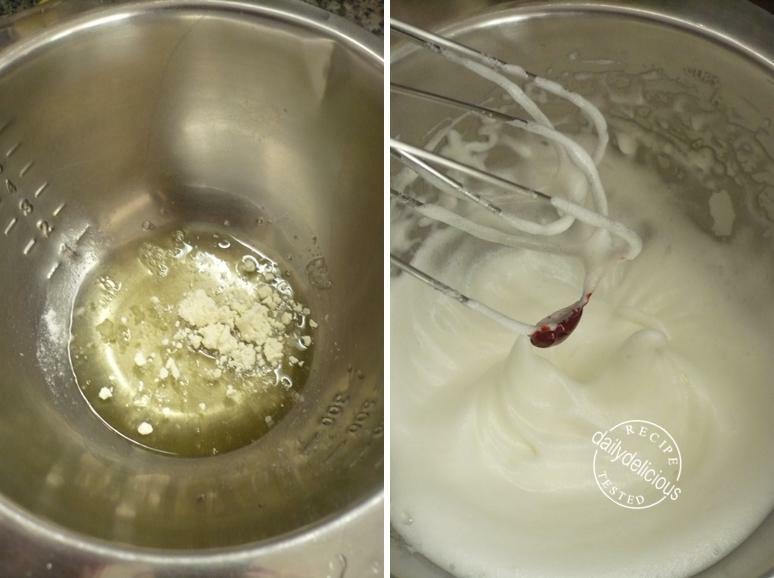 Beat the egg whites, egg white powder, and cream of tartar in the clean dry bowl of a stand mixer until they hold soft peaks. Slowly add the granulated sugar and beat until the mixture holds stiff peaks, add the color and whisk to combine. Sift 1/3 of the almond flour mixture into the meringue and fold to combine. Sift in the remaining almond flour in two batches. Don’t overfold, but fully incorporate your ingredients. Spoon the mixture into a pastry bag fitted with a plain half-inch tip (Ateco #806). Pipe 3.5 cm rounds onto baking sheets lined with nonstick liners (or parchment paper). 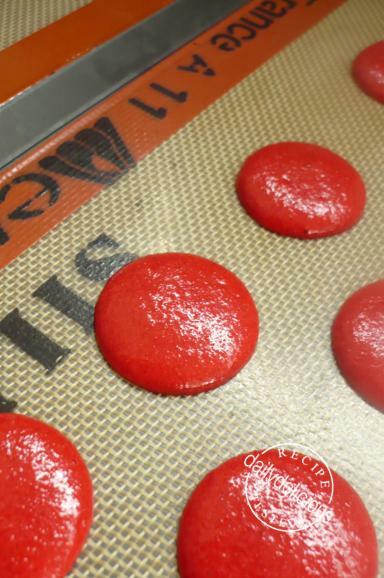 When you’ve pipe out all the macarons lift each baking sheet with both hands and then bang it down on the counter (you need to get the air out of the batter). Preheat oven to 150°C. Bake for 16 minutes (baking time can be varied, from 12-15 up to your oven) or until firm to the touch. Remove from oven and cool on trays. Slide a knife under each macaroon to release from paper. Store in an airtight container for up to 1 week or until ready to assemble. Pour milk and all purpose flour in small saucepan, bring to boil over low heat, stir until thicken. Take the pan out of the heat and let it cool. Beat butter and sugar together until light, put the milk mixture into the bowl, beat to combine. Beat in the strawberry preserve, mix until combine. Sandwich the macaron shells with the buttercream. Refrigerate for 1 hour to firm up the buttercream and serve. The red is so vibrant and beautiful! Where did you purchase the strawberry powder from? I don't think I can get any from here, so I was wondering if I should substitute it for icing sugar or almond powder instead? Just add 3g of icing powder instead of fruit powder. Can the powder egg white be omitted? Or maybe substituted with more egg white instead? 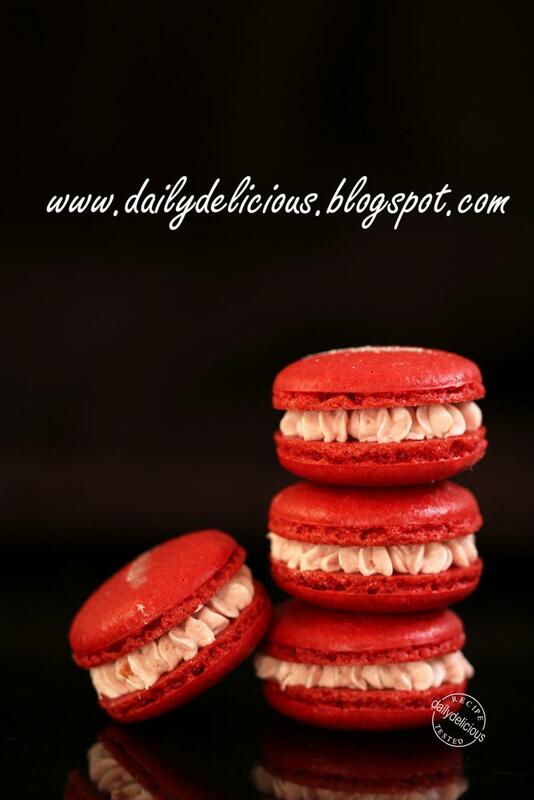 Love the red macarons...marvellous and gorgeous! I wish i have confident in making macarons...but never started once..scared of failing. You have to give it a try, I couldn't do it at first but getting better with it, I know you can make it too ^^. I really admire the works from ur hands. Awesome !! Oh I wished there were egg white powder here ... and yeah I totally get your first sentence about having a lot of imagination of baking..
Will the macaron formed If didn't add any strawberry powder or icing powder? Haha, I think we are the same ^^. You can't omit the icing powder, but for strawberry powder it's up to you. Such a beautiful looking macaron! I love the shiny shells. 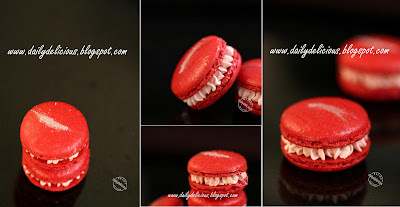 How did you get the shiny shell with French meringue method? My shells turned out looking dull after baking. ^^" really don't know the reason too, but it can come from the baking time or temperature too. You mentioned you got this recipe from a cook book. Would you mind telling which one it is? I tried your recipe the other day and it worked nicely :) Thanks so much for sharing!